Exam Board: Edexcel Level: GCSE Grade 9-1 Subject: English Literature First Teaching: September 2015, First Exams: June 2017 Everything you need to score top marks on your GCSE Grade 9-1 English Literature exam is right at your fingertips! 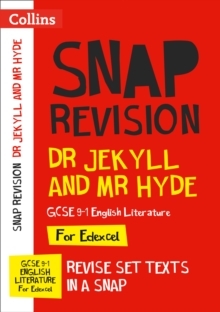 Revise Dr Jekyll and Mr Hyde by Robert Louis Stevenson in a snap with this new GCSE Grade 9-1 Snap Revision Text Guide from Collins. Refresh your knowledge of the plot, context, characters and themes and pick up top tips along the way to ace your Edexcel exam.